There is something that gets my mother blood boiling in seconds. Even as I write it I realize that it is irrational. Even so, if I spend hours transporting clothes to and from your room, the washer, the dryer, and the couch where I then fold and organize each item…at least once a week (Ok, ok…my husband totally helps me do this)….I am going to go a little crazy if I find your drawers shoved full of clothing as if they were never washed in the first place…and the drawers can barely close because items are bulging out. I take deep breaths and try counting. I remind myself that part of my job is to help my children learn HOW to take care of their clothes. This is a learning process and this moment? A learning opportunity. I immediately feel badly for freaking out over clothes sticking out of drawers, take some deep breaths, calm down…and start parenting. Ok, maybe it takes longer than just a few seconds to get to the parenting part. I sit down on their floor. They are starting to get upset in response to my anxiety that erupted all over their little girl or little boy room and I am trying desperately to mop up the volcanic ash of anger that I left behind with a more soothing tone. 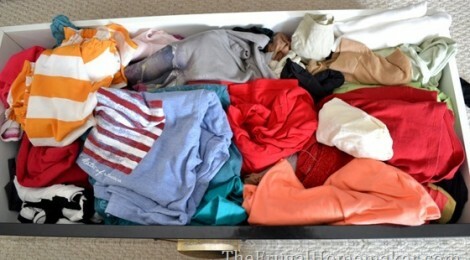 I start to help them re-fold and re-place their clothing in the drawers. While she shoves her words at me I fold each item and put them back in the drawer. She keeps talking and as I finish folding…I close the drawer…that she said wouldn’t close. No clothes hanging out. We’ve had this conversation before. I know my mother said the same things to me. My clothes hung out of the very same drawer in the very same dresser…in the very same bedroom. Later that night there are more struggles over math homework. Unfortunately, she is like her mother in this area, too. Math causes some anxiety. The irony is that it only causes anxiety because everything else comes so EASY to her that she has to stop and actually THINK to do her math homework…and that drives her a little batty. I sit for a while and watch her. She calms down…and starts working. I see light in her eyes as she makes the realization…she sure CAN do this. She finishes in just a few minutes. My heart fills with triumph for her. I so want her to learn not to shove things in drawers. I, myself, have too much experience with shoving already. I shove tasks into my day. I shove things on my to-do list. I fear I sometimes I shove relationships aside in pursuit of those tasks and completing the to-do list.. I look at the “math problems” in life and I get in a hurry. I’m anxious to Just. Get. It. Done. I get frustrated when I can’t do things quickly. In our technology driven society I get anxious if things don’t happen in a given time frame…say…a nano-second. Of course, the haste…makes waste. My fear and anxiety and hurry become a self-fulfilling prophecy and, like with those math problem, make things actually MORE difficult and take LONGER. I’m pretty sure, just like my daughter and my teenage self, I need to slow down and fold things piece by piece. Then things will fit. Or they won’t. Either way, I will know for sure…and can make better decisions. I need to take a deep breath and remember that I CAN handle the math problems in life. I CAN do this, but it might take some effort. It might take a process. A friend of mine introduced me to a new TED talk. Don’t know what TED talks are? Oh, friend, you are missing out! Anyway, this TED talk is on that little thing that seems to make a difference in someone succeeding in life. It isn’t IQ. It isn’t socioeconomic status. These researchers are calling it GRIT. Pretty much it is pure determination based on a growth mindset rather than a fixed mindset. A growth mindset believes that we are all in process. Failure is not a sign of imperfection or defeat. Perfection is not the destination. In fact there is no destination…not really…just a step by step journey towards our personal goals. I think we shove things in drawers when, like my daughter, think things “won’t fit”. We get anxious and try to hurry “math problems” in life when we aren’t sure if we can really do it in the first place. Taking our time? Trusting the process? This is a confidence issue…a faith and trust issue. Confidence…the latin roots of this word means “with faith”. When we are confident in God…when we are “with faith” in God…and in what He has provided to us in regards to our abilities and resources…we are more likely to…SLOW DOWN. We see what happens when a person does not trust and when they hurry in the story of Abraham. We read many scriptures in Proverbs about the value of slowing down. This isn’t about lack of action. Oh, no, no, no…we can talk about the value of being still and waiting, but what I am talking about here is taking steps recognizing that whatever we do is a JOURNEY. So, I am still learning not to “shove things in drawers” and to slow down on those “math problems”, AND I think what I am really still learning…and maybe you are, too…is to walk in confidence…”with faith”…in God. Go on. Slow down. Fold those items one by one. Take it step by step. Walk “with faith”…with confidence in God. I hope a light goes on, just like it did with my daughter…and as you are working on those life “math problems” you realize that you sure CAN do this. Your blog is so nicely organized and colorful and thoughtful. Thanks for sharing!